Turbula - Music - Review of "Troubled Child"
Smooth, old-school soul music is becoming a lost art. 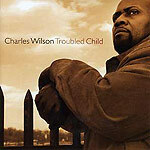 Charles Wilson has been singing blues-oriented music for years, releasing many discs for several labels; his most recent was a 2004 collection, "If Heartaches Were Nickels," that included plenty of R&B arrangements. His new one, "Troubled Child," is firmly committed to a '70s soul sound. The production by Steve Gomes and David Earl gives each song a full, lush framing of background vocals, nice guitar touches, organ, horns, a strong rhythm section and orchestration. The mix isn't busy and Wilson does his part by taking charge of each of the songs with a confident, emotional voice that has power and range but is not overly mannered or forced. The material is often the make or break factor for a disc like this, and doesn't disappoint. "Where My Baby Went" establishes the pattern by creating a shimmering instrumental cloud for Wilson to sing about his lost love, with guitar licks, strings and horns recalling Stax and Motown songs of old  even before a piano solo that sounds like Booker T. Jones. "I Want to Shout About It," usually played as a straight-ahead blues, is transformed into a Four Tops-style brisk soul anthem, while "Somebody's Tears" is the closest to a traditional blues, with a great guitar break by Gomes  it is also a tribute to Little Milton, Wilson's uncle. Another cover that leaves an impression is Bob Marley's "Is This Love," which becomes a soul nugget with a funk-riff verse and smooth-ethereal chorus. Wilson shines on the vocal, and this highlight is the best version of this tune heard in years. "I Don't Want to Take a Chance" is a slower, lighter soul ballad that scores as an example of how a lush arrangement can still work if the hook is catchy enough and it is sung well. Gomes' "Put Something Into It" pushes the beat, with some Steve Cropper guitar moments, and shows that Wilson can sing the fast stuff, too. "Troubled Child" is one of those combinations of an excellent vocal performance, good production decisions, and clever selection of material that combine for a very interesting and satisfying experience.